Sakura (Cherry blossoms) is a symbol of Japanese psyche. 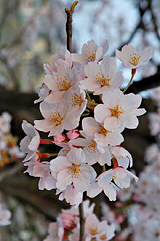 Cherry blossoms bloom within a short period of time and fall ephemerally in the spring. Japanese, especially, old-time Samurai warriors, loved such graciousness. Cherry blossom viewing is very special occasion for Japanese. I'm Hiroyuki, store manager of this shop. Please relax and take your time to browse our website. Once you decide to buy goods from us, we will handle your goods responsibly until you receive them in security. Easy and safe payment with credit cards. Our card settlement pages are secured with 128bit SSL. PayPal, another easy and safe payment method is also available. Send money with International Postal Money Order. Your package will be sent through EMS. (1)Fastest delivery. Same delivery time as other couriers such as FedEx or DHL. (3)Each package is given its own registered number so you can trace the package on the internet.